Specialists at Mayo Clinic are pioneering a life-saving procedure as part of a clinical trial for babies with congenital diaphragmatic hernia (CDH). When a baby’s lungs are not adequately developed at birth, severe complications and even death can result. Waiting for the baby to be born to intervene may be too late. A new study is underway to document fetal lung growth from early intervention before birth. CDH develops when a baby’s chest cavity is compressed and lung development is restricted because the diaphragm does not close completely and the abdominal organs push into the chest cavity. 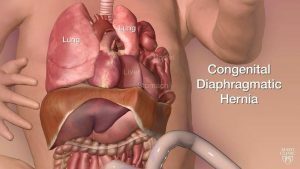 Congenital diaphragmatic hernia is a life-threatening condition affecting 1 in 2,500 births. The fetal endoscopic tracheal occlusion (FETO) procedure inserts an ultrasound-guided fetal endoscope through the mother’s abdomen or uterus into the amniotic cavity. The tiny scope advances to the fetal mouth and trachea, and a balloon is placed and inflated to close the trachea to promote lung growth. The balloon is removed in a similar procedure a few weeks later and before delivery. The minimally invasive procedure is documented in the June issue of Mayo Clinic Proceedings. The study includes two cases of severe CDH and documents fetal lung growth and reversal of severe pulmonary hypoplasia. One of those case studies is Xavier Sorying, now a healthy 7-month old baby. Before Xavier was born, his diaphragm — the muscle that separates the abdomen from the chest — developed a hole, resulting in CDH. A team of physicians, including Rodrigo Ruano, M.D., Ph.D., fetal surgeon, and Denise Klinkner, M.D., pediatric surgeon, performed a FETO. The resulting pressure then expanded Xavier's lungs and encouraged the growth of essential structures related to his lung function. “The fact that we collaborated and had such a great outcome points to what Mayo Clinic strives to do, which is to put the patient first," says Dr. Klinkner. You can read Xavier’s full story on Sharing Mayo Clinic. The study was funded by a grant from Regenerative Medicine Minnesota from the State of Minnesota. Dr. Ruano is the director of Mayo Clinic's Fetal Diagnostic and Intervention Center and the division chair of Maternal and Fetal Medicine at Mayo Clinic. Read related blog post on Dr. Ruano and his program.